This first image is one of the 7 Cricketsats built by the students. This one was assembled for a water landing (high probability in our area) by placing it in a lightweight water bottle. The black plastic bag on the left serves as a"streamer" to slow its descent. No direction finding was planned, so no DF gear was on hand. After the days launch activities were over and several small simsats were launched, we thought it would be fun to go see if we could find one. We chose to go look for the one called Cricketsat G2, since it appeared to only have a 45 minute flight life before it was heard to descend. 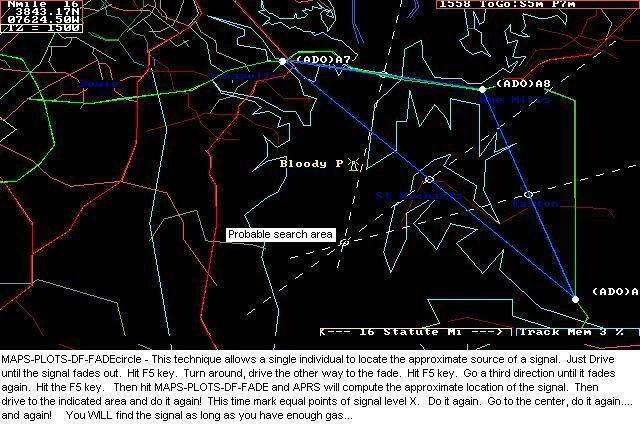 This suggested that it was not that far away..
To a ham radio enthusiast Direction Finding is a cause for a challenge. We wanted to go see if we could find one anyway, with nothing but our hand held walkie-talkie. We used what the Hams call, the fade-circle technique. This is a cimple technique for just this kind of as-you-are recovery effort. The Process is simple: All you need is your mobile rig and an HT and some greay matter between the ears, and you can find anything. Almost as easy as driving right to it (and back and forth a bit). Just visualize signal strength, and always go to the middle of your maximum signal along any line of travel. Then turn 90 degrees and again go to the middle of the signal maximum, turn 90 degrees again, and repeat, and repeat. As signal gets stronger, switch to HT. As signal gets stronger, switch to paper clip antenna and repeat. As signal gets stronger, switch to one INCH piece of paper clip in HT antenna jack and repeat. As signal gets stronger, remove antenna completely and repeat. ETC. Finally, reach out an pick up the transmitter. Done. TECHNIQUE: Remember, we had NO POSITION INFO at all. All we knew was that the key-chain transmitter on 433 MHz was last heard approximately NORTH of the launch site. . Ignore the BLOON-2 OBJECT you see on this APRS tracking web page. It was placed on the map only after we had found the general area of the landing. This object was uset to mark our location we got out of the car to start our foot search. This symbol allerted launch control where we were beginning our foot search.